Recently, we at Freshersworld wanted to understand scenarios and situations when companies take time to hire candidates, in spite of a vacancy being open for a long time. We were sure that filling up this gap would add immense value to employers. It would also throw some light on where majority of entry level job seekers / freshers lose out on, resulting in a delay in securing jobs. The team took up a quick research to comprehend factors that could enable both employers & job seekers find their suitable matches quickly. While various insights came to our notice, something interesting that cropped up was a “Job Fair”. Freshersworld enjoys a huge employer/HR connect which has always been nurtured online, on campus drives and through end-to-end recruitment solutions; but never on a Job Fair. Thus was the rise of an idea to organize a job fair. Job Fairs are one of the best events where huge masses of employers and job seekers meet. A Job fair facilitates candidates to reach out to multiple companies under one roof. It also enables employers to find job seekers in large numbers assembling at one place and complete hiring in one go. Reaching out to large number of students: Job Fairs are not just to accomplish recruitment but are a complete branding amongst the youth. Job Fair events are thronged by final year students, recent graduates and entry level job aspirants in large numbers. These events generally have a very long-term brand impact and are very effective ones as well, since the company is perceived as an entry-level-hiring friendly brand, among the masses. Elaborate arrangements are made: Organizers ensure that all the arrangements are taken care of, eliminating the need for recruiters to run about for arrangements like venue, registrations, promotions, and student turnout. Job fairs have to be organized on a large-scale and when arrangements for such events have to be big, it is surely an event not-to-be missed by HRs. Number of attendants: The Job Fair organizers ensure a proper reach of the event to draw as many job seekers as possible to make the event big. It is not viable even for big companies to organize such fairs on a large scale since turnout of students would be comparatively less due to the disadvantage of not being able to attend multiple companies in a single event. 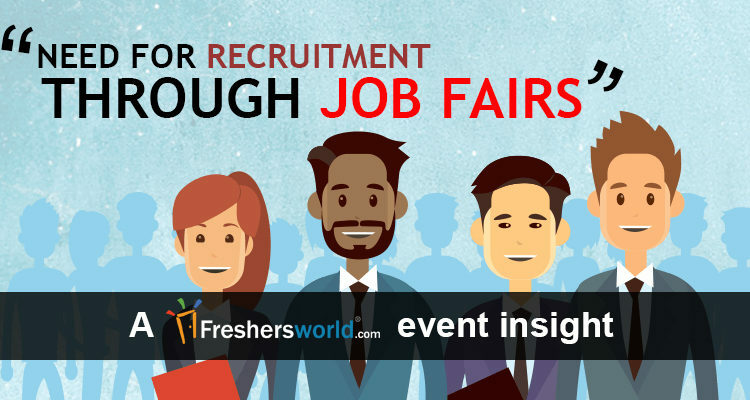 Joby Joseph, CEO & Founder – Freshersworld.com says that organizing a Mega Job Fair successfully, attended by around 150 recruiters from 60 companies and 3700+ job seekers in Bengaluru recently has not been an easy task. A lot of planning, coordination, technology-backed-processes and promotional efforts collectively have made up to the successful Job Fair. It has been carried out with relative ease only due to the expertise Freshersworld has gained over the years in the field of recruitment. Nestaway Technologies, Janalakshmi Bank, Ninjacart, Educaro, Swiggy, PVR are some of the companies that participated in the Job Fair. From a consolidated feedback received from the employers, it is evident that most companies were able to close several vacancies, if not all. It is certainly an experience for HRs to participate in such Job Fairs to close multiple vacancies in a single drive. A good Job Fair is no doubt the best place to reach out to a large pool of job seekers and fill open job positions with utmost ease. Informative article.. !! Thank you for sharing.